What is DMT? Is DMT safe? How is DMT used? What is a safe dosage of DMT? What are the physical and psychological effects of DMT? Is DMT safe to use with other drugs? What is dmt and what does it do? What is a DMT breakthrough dose? Psychedelics Daily’s Essential Guide to DMT explores these questions, and other DMT facts in depth. DMT or N,N-dimethylTryptamine is a powerful hallucinogenic substance that occurs naturally in plants and animals around the world. It is also referred to as the Spirit Molecule given that it produces profound spiritual states. DMT is also found in the human brain as a neurotransmitter, our blood, urine, and spinal fluid. DMT is conjectured to be produced in the human pineal gland by Dr. Strassman, however there is no concrete proof as of yet. Pineal Gland & DMT: Is DMT Produced In The Brain takes a deeper look into the link between DMT and Pineal gland. In the Amazon, there exist many tribes which consume DMT. Quechuan tea, which is used for religious and ritual purposes by the indigenous, contains DMT. They combine DMT with an MAOi found in the B. Caapi vine to make Ayahuasca, one of the most powerful hallucinogenic drinks. Ayahuasca allows the shamans to journey into the spirit world and connect with the life force of the Earth. Why is DMT known as the spirit molecule? Erowid DMT Vaults suggest that DMT was synthesized by Richard Manske in 1931. In 1956, Dr. Stephen Szara demonstrated that DMT induces intense hallucinations, distortions within space-time, profound psychological shifts and euphoria. Psychedelic research gained fame and momentum during the 1960s with the discovery that DMT can be found in human urine and blood. (Franzen and Gross, 1965.) In 1970, with the enactment of the Controlled Substances Act regarding hallucinogens, research came to a grinding halt. Rick Strassman, a psychologist at the University of New Mexico began a five year study of the effects of DMT on the human body in the 1990s. Strassman thought that the profound psychological changes produces by the drug warranted further research. He began by publishing a number of research studies about DMT, including detailed dose-dependent experiments using the Hallucinogen Rating Scale to measure subjective experiences. Strassman later published a book called The Spirit Molecule in 2000, widely considered an authority book on the subject of DMT. DMT seems to actually be a necessary component of normal brain function. Research was also conducted by Alexander and Ann Shulgin, which was published in their Psychedelic Drug Bible known as TiHKaL (Tryptamines I Have Known and Loved). It was their personal research into the effects of DMT on the mind and body. Their research described dose-dependent subjectivity of the experiences. DMT is a Serotonin (5HT) receptor agonist. 5-HT2-A receptor subtype agonism is primarily responsible for the hallucinogenic activity. DMT produces one of the shortest lasting psychedelic experiences, next to Salvia Divinorum. The main part of the experience is over in 15-20 minutes (Salvia duration is much shorter, about 1-2 minutes). The taste and smell of DMT can be described as burning plastic or moth balls. Some people describe it as a smelly foot! LD-50 stands for Lethal Dose 50%. This is a measurement of the lethal dose of any substance. In toxicology, when members die after a certain dose administration, that dose level is called LD-50. It is the dose which is required to kill half the test population. The exact LD-50 of DMT has never been established. Scientists have conducted experiments with mice which detail that a lethal dose in humans by comparison would be extremely high; more than 20 times the typical “effective” dose. For this reason, DMT is considered to be very safe among psychedelic drug users, according to Erowid DMT Research. DMT (not Ayahuasca which contains many more substances as well as an MAO inhibitor compound) is synergistic with many other psychedelic substances and interacts quite safely. However, there are many substances which should be avoided entirely or used with caution if a DMT trip is planned. DMT is primarily a Serotonin receptor agonist. As such, anything which affects the Serotonin system should be mixed with DMT with utmost caution. Dangerous Interactions Source: Bluelight Psychedelic Forums. I simply avoid these substances and have no desire to use them. Scopolamine (Be very careful with Scopolamine. It can be dangerous if not used correctly. If you are not experienced in Scopolamine, please do not use it or mix it with DMT). Note: You may find many resources online suggesting the use of DMT + Mescaline/MDMA (any phenethylamine) is dangerous. There is more to it than that. Speaking from personal experience, having done DMT over 1200 times, and combining it with almost everything I could find under the Sun, I can tell you that a Serotonergic agonist like DMT works really well with Dopaminergic agonists such as Mescaline or MDMA, so long as no MAOi was consumed. The only time that MDMA or Mescaline interaction is dangerous with DMT is when DMT is combined with MAOi. MDMA and Reversible MAOi (RIMA) Reversible Inhibitor of MonoAmine oxidase (type A). Smoked DMT while on the peak of a MDMA or Mecaline are safe to use as far as I know. Ayahuasca and Mescaline, Ayahuasca and MDMA are dangerous combinations. Extended State DMT xDMT.org and Prolong the DMT Flash conduct research using an interactivity and synergistic model. xDMT reports that DMT is not dangerous by itself in combination with other dopamineric agonists, physiologically. However, psychologically, many interesting effects are to be noticed. 1200 DMT Trips: Navigating the Other Side. Over 600 DMT experiments I’ve broken through. Over 600 more, I slowly navigated to the Other Side gradually increasing the dose from 5 mg to 120 mg and documenting the experiences. DMT profoundly affects both the mind and the body. The user is transported to alien reams where meetings with DMT Gods and DMT creatures is very common. The DMT Beings are intelligent and often impart knowledge. This required a DMT breakthrough dose. Most people find spirituality and enlightenment in the use of DMT. DMT seems to help with depression, anxiety, end of life fears, and helps us to understand our nature. DMT’s threshold dose is roughly equivalent to 0.2 mg/kg of body weight. This translates to approximately 5-10mg. 2mg - 5mg: Other than an extremely mild hint of a bare perception of the body, there is almost nothing perceptual at this dosage level, unless combined with 7-MeO beta-carbolines, which affectively doubles the efficacy. 10mg - 20mg: Everything becomes dry. It feels as if there is some sort of a weird liquid fluidic-spatial reality. Every single cell in the body begins to become aware of itself. Every cell beings to scream, “I’m alive!”. This awareness of the body, its physical dimensions, and its physical place in three-dimensional space happens rather oddly. 20mg - 40mg: The body melts away into a sea of nothingness. You are barely aware of the body and the entire experience at this point is psychological. 40mg - 60mg: There is a complete loss of contact with physical reality and you are transported into the alien realms. DMT makes it feel as if our heart is pumping fast and that we are experiencing death, but oddly, the fear of death also melts away. DMT makes us see sacred geometry, and the DMT fractal patterns so well known in psychedelic cultures. DMT Mandalas are all over indigenous and tribal art, and we can guess that DMT is behind all mandalic art forms, all over the planet. DMT forces upon the individual the phenomenology and alchemical psychology of individuation. DMT forces upon the individual with haste, with eclat, without hesitation its own agenda. DMT can induce states of consciousness that have lasting personal meaning and spiritual significance in individuals who may or may not be religious or spiritually inclined; these states are called mystical experiences. Low doses of DMT produces altered emotional states without any hallucinations. Higher doses produce a rapid onset of emotions, feelings, ideas, and conclusions. On DMT, you are the center of the Universe. Everything revolves around you. Everything happens for you. This is the realization of the indivisibility of the individual. Fear and anxiety are common, as well as euphoria and ecstasy in a simultaneous paradox. One of the noted properties of DMT is that it takes you into an alien world, populated and alive with intelligent beings, aliens, guides and helper spirits. Terrence McKenna called these “machine elves”. Rick Strassman’s work found they take the form of “clowns, reptiles, mantises, bees, spiders, cacti and stick figures.” These visions (of jungle animals) seem to be unique to DMT. DMT produces a very short lived tolerance, which lasts only 45 minutes to an hour, after which the tolerance resets back to baseline. Ayahuasca (a brew containing DMT) is taking the modern world over as a potential treatment for depression, addiction, PTSD and anxiety. Even smoking DMT has profound affects on a variety of conditions. 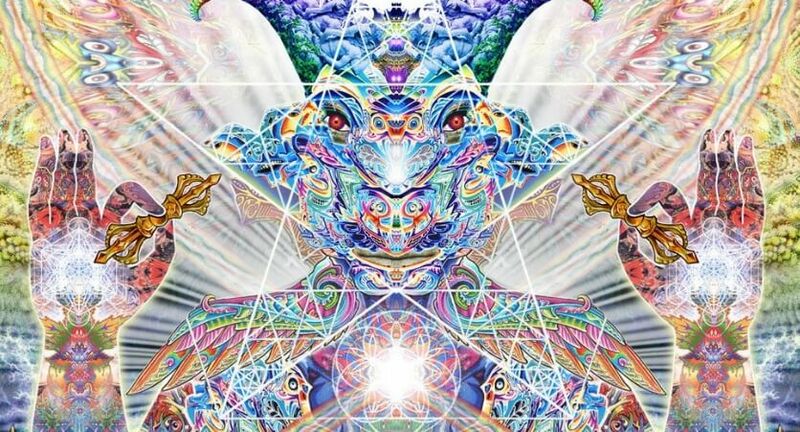 DMT hallucinations often show us meetings with DMT gods, otherwise known as DMT elves, or DMT beings, which impart important information about ourselves and about nature. DMT’s therapeutic effects come from its ability to cause increased awareness of the mind and body in users. Thousands of users anecdotally suggest that after an Ayahusca experience, self-judgment, fear, and internal emotional imbalance is calibrated back to normality. DMT can be used for heigtened self-awareness and an unbreakable spiritual connection to all life. DMT dissolves the notion of the ‘self’ as commonly understood. DMT brings one to the other side. It enables one to witness oneself as the center of everything, which is the ultimate truth. It enables the manifestation of the essence of the “wholly other” within. It causes the profane to manifest itself readily before the sacred, giving us an unobstructed view of existence in whole. DMT causes the manifestation of the ultimate reality within as the sacrality of the numinosity of directly felt experience, which is the realization of the Ganz Andere, the Wholly Other, the Standing Stone, the Obelisk of Might, the Immovable and Immutable Law of the Totality of Self in this cosmic dimensionality. Growth is change. Change is when one continuum completely ends, and one’s entire reality changes in an instant. Change, therefore, is not a time-based process, but it happens instantly without time. To be free of time is to be free of comparison, is to be free of thought. When one is free of the separative structure of thought, there is no such thing as change or stagnation. There is no such thing as spirituality or enlightenment. There is only ever the authentic and true state of the organism. True wisdom is realizing that there is nothing to grow, nothing to change, nothing to transform, and nothing to evolve or revolve. Change is a time-based process. It implies a comparison, that something is less now, but will be “more” later. It’s something else now but will be something else later. So the organisms thought produces this illusion of a future self to change to, then continues to strive after it everlastingly.